Pen-and-ink drawing by an anonymous artist of a tomb at Tughluqabad in the Punjab, India, dated 1814. The image is inscribed on the front with notes; and on the back in ink: 'Tuglucd.' Tughluqabad is one of the old cities of Delhi and consists of the massive ruins of a palace, citadel and fort complex, built between 1321 and 1325, by Ghiyath-u'd-din Tughluq, the founder of the dynasty. 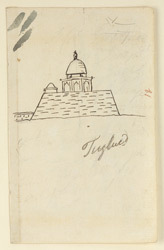 The sketch shows what is likely to be the tomb of Tughluq himself. It is set to the south of the ramparts of Tughluqabad at the end of a causeway on an artificial island that once stood at the centre of a lake. The tomb itself is square in plan, with battered sides, and faced in red sandstone. It is topped by a white marble dome.